The News for the week: Engineering Education in India: Where quantity doesn't drive quality, Lacunae and way forward. Every year thousands of brilliant budding engineers leave Indian shores to pursue their dreams abroad. Many of them go on to start businesses in their adopted countries. Barely a few of them return to India with purpose of settling down here. But it is fact that they have played a big role in making India a respected name in IT industry with their acquired skills from the west. It is the skill set that matters and not the degree. With our engineering system this seems to be a major shortcoming in the scheme of things. The number of engineering colleges has grown by leaps and bounds in the past 10-15 years on account of growth in IT industry. At present there are about 3400 engineering colleges in India with combined capacity of 14, 75,000. Despite churning out such a huge number of engineers every year, India performs dismally in innovation indices. 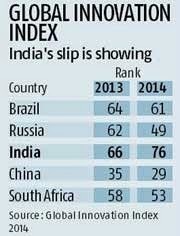 For the year 2014, India has slipped further in the rankings to 76th rank. This is despite a spate in the number of engineering colleges in India. Small countries like Switzerland and Singapore have performed way better than us. The country does perform well with the improved quality of its universities, IT services exports but these strengths are outweighed by weaknesses in its institutional pillars such as political stability and will power, ease of starting a business, ease of doing business as well as human capital and research. Engineers are problem solvers of the society. Innovation comes from engineers. Innovation gives a breakthrough, like the steam engine which ushered the world into industrial revolution. It is scientific and engineering achievements of UK of 17th and 18th century that propelled Britain to supreme position making it a superpower. USA is a super power not because of military but because of its advanced military technology and economic clout owing to its superior education system. It could kill Osama because it had a helicopter which made no noise, an engineering marvel. It used its GPS system to confuse the Iraqi fighter pilots in the 2003 war. It won the Second World War because it was the first country to have a nuclear bomb. Any power worth its name in the past and even today has been a leader in engineering prowess. With an emphasis on Skill India project of the Modi government, there is a renewed interest in India all over the world. The lacunae of present engineering system of India has been the emphasis on rote learning and less emphasis on research and development and curiosity driven learning that leads to genuine learning. As per Ravi Kiran , SAP Labs India Knowledge Management director “There is a mismatch between training offered by engineering colleges and the needs of the industry in India , which leads to an increase in the demand-supply gap. The number of engineering pass-outs every year was higher than the demands in the IT industry, but, unfortunately, there was a severe scarcity of ‘industry-ready’ engineers for most jobs. This includes not just IT but other streams as well. This is mainly due to the sharp variation between industry requirements. IT wings are now a very important part of any business irrespective of its size, be it the banking industry, insurance, health sector and governments as well. But fresh pass outs are struggling to get a job that does justice to their aspirations. On the other side the employers are not happy with the quality of engineers that are being added to the market every year. In the western countries like Germany, the syllabus is designed keeping the Industry leaders on board so as to know what would be skill set needed to get jobs in any particular industry. It is the skill that gets you a job and not a degree. Industry associations like ASSOCHAM and NASSCOM should be consulted while the AICTE (All India Council for Technical Education) prepares the syllabus. The engineering education in India needs to be dynamic as in its adaptability to the requirements of Industry, not just in India but globally. Indian engineers fall short in meeting the exposure to practical aspects of the syllabus. The so called ‘state of the art laboratories’ of our colleges including the IITs do not compare with those of MIT and Yale. This is also an area of opportunity. Engineering needs to be developed as an attitude, the one that says; that’s the problems we have let us see how we can solve it. India at present is emphasizing on developing its manufacturing sectors which in simplest definition can be called the process of value addition. If we have steel, we should not just make utensils rather use it in making i-phones. May be, an innovative use of it. When you innovate, you already become the leader. We need our own Microsoft, Facebook, i-phones now that we can sell as products to other countries. Engineering system in India needs an overhaul and that should come from the policy action supplemented by efforts of those who would be implementing it. One welcome change would be incorporating entrepreneur qualities in our future engineers so that not only become employable but also go on to become employers consequently. With the ever changing scenario, the only thing constant is change and any system should be robust enough and at the same time flexible enough to attune itself to the changes industry undergoes. Engineers are going to play a significant role in making of new India but that would be a reality only when we strengthen our Engineering system. We need Quantity to drive quantity and vice versa.